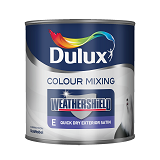 Weathershield Quick Dry Exterior Satin from Dulux is a water-based product that provides an attractive mid-sheen finish. Leave 6 hours to dry. Newly painted doors and windows should not be closed until paint is fully dry. Apply 2 coats of Dulux Quick Drying Wood Primer Undercoat to primed surfaces with a brush. Finish with 1 or 2 coats of Weathershield Exterior Satin. Some dark colours may need a further coat. TIP: it is advisable to only use light colours on south facing resinous wood. Apply only in dry conditions, above 10 degree Celsius and when bad weather is not forecast.